As Debbie Wiseman notes in her introduction, the title comes from the phrase often uttered by directors during spotting sessions when they decide where they think they might want some music. Here on this newly recorded anthology are a dozen “something here’s”, plus a 17 minute original work, The Ugly Duckling, expanding upon themes from the new film My Life As A Fairytale: Hans Christian Andersen. Music from this film actually comprises a five minute suite as the second cue onSomething Here. This is richly orchestrated, highly melodic fairytale music, as eloquent and charming as anything Wiseman has previously written. It calls to mind the scoring on the composer’s Stories of Oscar Wilde, and not only does the current album begin with Wiseman’s opening music – a witty Western pastiche – from the film Wilde – but it ends with the aforementioned setting of The Ugly Duckling, very much continuing in the vein of The Nightingale and the Rose and The Selfish Giant from her Stories album. Of course this sort of thing must be traced back to Prokofiev’s Peter and the Wolf, but Wiseman makes the form all her own with some deliciously well crafted writing sure to delight the young at heart. Nigel Havers makes an excellent narrator, being just as accomplished as Stephen Fry and Vanessa Redgrave on the previous disc. Much of the music here is very recent. The suite from Before You Go (2002) begins as a perfectly honed pastiche of an up-tempo passage from a Mozart piano concerto, then develops a more modern lyric theme for loss and mourning. Most appropriately sequenced to follow is a grave and dark hued suite from Tom and Viv (1994), while a suite from Judge John Deed (2001) combines a march with a clarinet-led love theme. For those who are familiar with the original version of the composer’s theme from the superb BBC drama Warriors, the new version here may initially come as a shock. Gone is the keening wordless vocal, gone is the stark percussion, in comes the much more lush sound of the Royal Philharmonic strings, the melody taken alternately by solo violin and woodwind. The result is a more gentle reinterpretation of one of Wiseman’s finest inspirations. It is still highly moving, if a little less distinctive, and certainly less spine-tingling. My Uncle Silas (2002) offers a suite featuring a lovely waltz and more lovely woodwind writing again in similar vein to the composer’s recent fairytale pieces. Simon: An English Legionnaire (2002) follows the true story of an Englishman in the French Foreign Legion in Algeria in 1962, the music here reflecting more of the aristocratic sensibility of Simon himself than the North African setting. While the film music proper part of the disc ends with a more serious suite from Wilde than the playful introductory music, there is also a finely crafted seven minute suite from Haunted (1995), a selection from the most recent version of Tom’s Midnight Garden (1999), and a powerful condensation of the dramatic score for last year’s ITV updating of Othello. A well rounded and balanced anthology, the only problem is that it leaves one wanting to hear more of the individual scores. Perhaps if enough people buy this album there will be a volume two. Meanwhile this is a wonderful disc, recorded with fine sound, from one of our finest composers. The RPO play as if born to the music. Debbie Wiseman’s reputation for melodic, stirring film music has grown in stature continuously since 1994, when her first score for the turbulent story based on T. S. Elliot’s first marriage, Tom And Viv, projected her into the limelight. Since then she has gained many accolades, including a nomination for an Ivor Novello Award in 1997 for her magnificent score for Wilde, starring Stephen Fry. She has also written some highly memorable scores and themes for television productions, such as Warriors and Judge John Deed. With many new projects already completed in 2002, it is therefore fitting and perhaps well overdue that a collection of her themes should be released. This collection is both retrospective, including cues from previous projects and progressive, including cues from very recent scores. The opening cue is ‘Wilde West’ from Wilde. This is a probably the best cue from the film, a wonderful, lyrical piece of music which charmingly cannot decide whether it is set in Ireland or Utah, but comfortable in both. The score for Wilde is revisited towards the end of the album with a forceful, dramatic rendition of the main theme. The second cue is from a 2002 Hallmark production, My Life As A Fairy Tale: Hans Christian Andersen, in which the composer’s gentle, but firm style produces a varied and fascinating preview into what must be a wonderful score. Also produced in 2002, Before You Go stars Julie Walters and has an elegant, up-lifting and airy Bach-feel theme. The score for Tom & Viv, is a gentle, pensive piece which later becomes more serious and dark as Vivienne’s mental health deteriorates. The final cue is a 17-minute rendition of Hans Christian Andersen’s fairytale, ‘The Ugly Duckling’, narrated by Nigel Havers and set to Debbie Wiseman’s music. While this is a splendid work, it is a strange bedfellow with the other dramatic and sensitive music in this collection and by its nature would only merit the occasional play, unlike the preceding cues which deserve far more air time. It might have been preferable to leave the narration to a separate album and just include the lovely music. The music on this album is an outstanding display of Debbie Wiseman’s talent, demonstrating her wonderfully lyrical and dynamic approach to scoring. It is also a unique opportunity to gain some wonderful music, like that from ‘Judge John Deed’, not otherwise available. Really enjoyable. 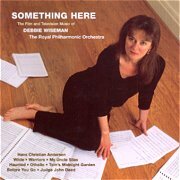 Something Here is an attractive selection of suites from the career of British film and television composer Debbie Wiseman, performed by the Royal Philharmonic Orchestra under the composer’s own baton. Wiseman’s music is distinguished by an assured grasp of orchestral technique combined with a fluent gift for languid, often melancholic melodic writing. The result is meticulously constructed, consistently charming and frequently beautiful music-making. As an example, sample here her breakthrough score for the romantic drama Tom & Viv (1994), with its characteristic upwardly yearning theme, and note the subtlety of the orchestration as first woodwind and violins, then violas and cellos share the theme between them before the brass section leads the whole towards a poignant climax. The same combination of careful musical structure and naturally fluid melody pervades every item on the disc, though arguably Wiseman’s music is most effective in the more introspective pieces: Warriors, Wilde and Haunted, to name three. If the fine film music performances were not recommendation enough, this album also features the world premiere of a lengthy concert piece, The Ugly Duckling, a setting of the famous fairy tale inspired by her score for Hans Christian Anderson(also recorded here) and delightfully narrated by Nigel Havers – this would make an ideal introduction to orchestral music for any child. As with her previous Oscar Wilde suites, the words have clearly inspired Wiseman to provide music of especial charm and deceptive simplicity, radiant melodies lambently scored. Simply Gorgeous might have been a better album title after all.